Sage partner Hightower Inc have just announced that their Multi-Bin for Sage ERP MAS90 and MAS200 version 4.4 is available. The Sage MAS 90 and Sage MAS 200 Inventory Management module provides receipt of goods data, the movement of goods within or between locations, the sale, removal of goods, and the precise valuation and status of goods remaining in inventory at any point in time. When integrated with Multi-Bin Advanced Distribution, you will be able to track multiple bin locations per warehouse per item. With the Sage MAS 90 or Sage MAS 200 Sales Order module, you’ll know the availability of specific units in inventory, or alternate items if an item is out of stock, specific customer pricing, customer credits, and much more, while entering orders. With Multi-Bin Advanced Distribution, you can mark inventory items involved in sales orders as allocated. Allocated inventory items are not available for purchase by other customers until you release the items. Streamline and organize your entire purchasing process – track shipping methods, track the date a purchase is required, track the name of person that places the order, and confirm the quantity ordered and the price. Multi-Bin Advanced Distribution modifies the Sage MAS 90 or Sage MAS 200 Purchase Order module to utilize bin locations for receipt of inventory items. Bin locations are also utilized for return of goods and material requisition entries. Sage MAS 90 and Sage MAS 200 Bill of Materials allows you to easily create and maintain a detailed bill of components and miscellaneous charges that make up your finished items and subassembly components. Multi-Bin Advanced Distribution module integrates with Bill of Materials so bin quantities can be tracked throughout the production and disassembly processes. With RMA, once an item is returned, Sage MAS 90 and Sage MAS 200 will automatically generate all appropriate transactions, including credit memos, replacement orders, purchase orders, and vendor returns. Multi-Bin Advanced Distribution integrates with the Return Merchandise Authorization module so that quantity can be distributed to bins before transactions are generated. Issue work orders, develop schedules, and track costs associated with the manufacturing process. Sage MAS 90 and Sage MAS 200 Work Orders gives you the ability to see up-to-the-minute work in process information. The Multi-Bin Advanced Distribution module integrates with Work Order so bin distributions can be entered and updated along with each work order entry. With Bar Code, collect data more quickly than ever before – warehouse and shipping/receiving staff can record bar coded items with a scanner and data is downloaded to Sage MAS 90 or Sage MAS 200. Multi-Bin Advanced Distribution modifies the Bar Code module by expanding the import files to include bin locations. Need to track time for multiple users? If you’re a MAS 90 or MAS 200 user with a large number of users who want to track time then the Hightower TimeKeeper solution might be for you. Because Timekeeper is fully integrated with your Sage MAS 90 or Sage MAS 200 ERP system, you can process all time/expense entry information into a number of the modules, including Sage MAS 90 Accounts Receivable, Sage MAS 90 Job Cost, Sage MAS 90 Payroll, Sage MAS 90 Sales Order, Time and Billing, and Time and Billing Professional. This level of integration enables you to increase overall efficiency and enhance service to your clients by tracking employee time and expenses for accurate and timely invoicing. You can enter time/expense data into your Sage MAS 90 or 200 software using the Timekeeper module, the platform independent Timekeeper Entry application, or online via .timekeeper. All of these solutions are available when you install Timekeeper. Choose the best time/expense entry solution for your company. The following list describes each solution. I’ve had several clients use the system and have found it to be an excellent solution for anyone looking to track time without having to invest in a more expensive time and billing system (which Hightower offers with their Time and Billing Professional for MAS90). There’s a free online web demonstration scheduled for 9/1/2010 — click here to register or for more information . Need Time and Billing for your Sage MAS 90 or MAS 200? The most viable solution is from a company called Hightower who have been marketing their Time and Billing Professional and TimeKeeper software for as long as I can remember. They ran a limited time promotion for users who purchased at Insights 2009. Looks like this has been extended through June 30. – Premier Plan $995 (normally $1,200) includes new and upgrades from value plans. Interested? Sit with your Sage Business Partner and tell them Wayne Schulz say’s call Patti Benitez at Hightower who is the representative that can set this all up. 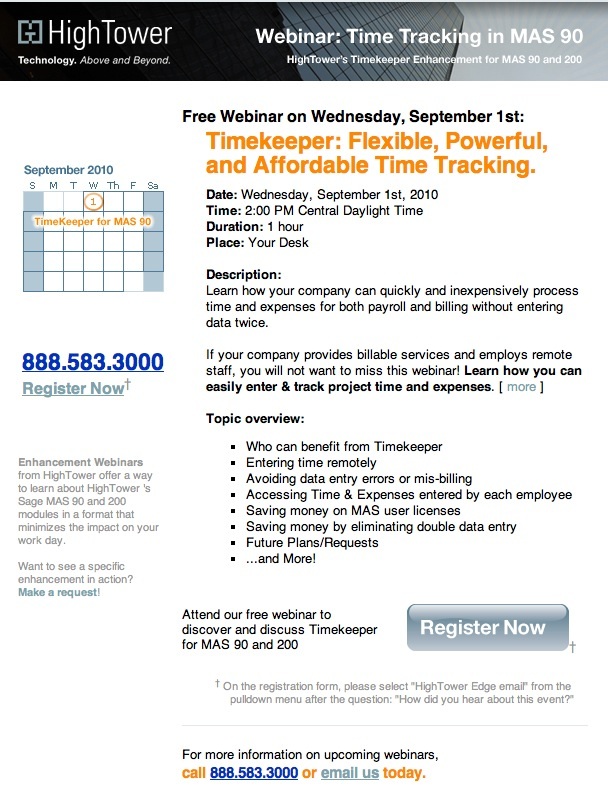 I had a client purchase Hightower Timekeeper plus their remote timekeeping solution. The client intends to use the Timekeeper software to track time for 40 members of their staff as they work on different client matters throughout the day. At the end of the reporting period they’ll generate reports from the system that provide an accurate breakout of where the employee’s have spent their time. This makes allocations (and billing back expenses) much easier and more accurate than their old method which was basically to estimate. One of the best things about Hightower Timekeeper is the remote solution. The setup is a snap and within 30 minutes we were able to log in on the client’s network and run a Timekeeper data entry screen via the web. All data entered is updated in real time to the Timekeeper module. The licenses for Remote Timekeeper are cheaper ($40 ea) than regular Sage MAS 90 licenses so this is a much more economical way to gather time via the web. The one piece of the puzzle that we had to give some thought to was how to setup the Web Server so that it ran as a service. 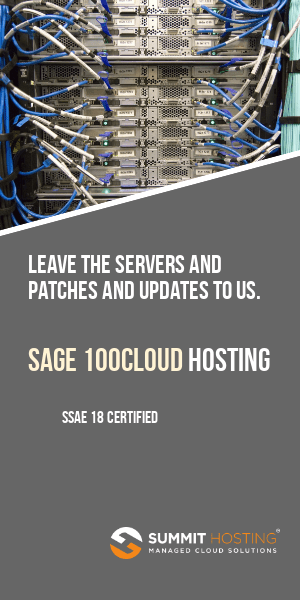 We wanted to run the server software as a service so that a user would not have to remain logged in and so that in the event of a server reboot we could be assured that the server would startup unattended. There are two components to this. The first is the PxPlus interpreter which by default configures itself to run as a service. Had to remove the “CONTROL” from the last line to get it to work on windows 2000. That installs the service, worked perfectly.